The most eagerly awaited sequel to Angel is here and I for one could not wait to read High Force. It had no sooner dropped on my kindle than I had read and devoured it, reading way past my bedtime but powerless to prevent myself from reading just one more chapter. High Force picks up seamlessly where Angel left off, and if you've read Angel you'll know just what a jaw-dropping cliffhanger of an ending us Ryan fans were left with. Keir Edwards, aka 'The Hacker', returns to haunt Ryan after his escape from prison and continues his personal vendetta against Ryan by kidnapping one of his colleagues. In a game of cat and mouse, Ryan and the team investigate every possible lead in order to rescue their friend and colleague. With an ultimatum from The Hacker, they have a race against time to find his location before he claims another victim, one they care a lot about. LJ Ross has another North East adventure in this amazing series, with some of my favourite local attractions featuring in High Force. There's High Force itself, although unlike the other books in the series it only features in the last quarter of the book. High Force is a spectacular waterfall in Teesdale where the River Tees plunges over the famous 295 million year old Whin Sill. I was also delighted to see Blanchland featuring in the book; it's one of my favourite villages to visit and I have been known to have a pint or two in The Lord Crewe Arms with its famous priest hole hidden within the fireplace of the adjoining hotel. Even though I know the locations well, they are so vividly described that even people who have never visited the area will be able to create an accurate mental picture. Although each DCI Ryan novel could be read as a standalone, you would get the best Ryan experience by reading them in order. The characters become so familiar that you know everything about them and you care what happens to them. I would absolutely love to see the DCI Ryan series picked up for TV to bring these fictional characters to life, as I have to keep reminding myself that they're not real...but they are real in my head. 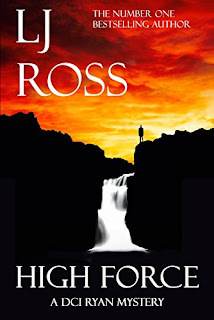 High Force is another outstanding book in the DCI Ryan series penned by the super-talented LJ Ross. Be warned before you read it: it is covered in virtual superglue so once you pick it up, it is impossible to put down. It felt like a few loose ends were tidied up in High Force but there are too many DCI Ryan fans (yes, we're all a bit in love with him) for this to be his last outing. Thankfully, LJ Ross shows no signs of stopping here (I hope) and manages to churn out her books in quick succession without scrimping on quality. Miss this series and you will regret it. All of us book bloggers cannot be wrong (we never are).